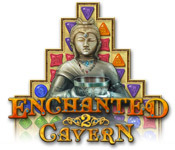 Enchanted Cavern 2 is rated 3.4 out of 5 by 40. Rated 5 out of 5 by ooakPlayer from Thoroughly "Enchanted"! …or perhaps I should have titled this "Thoroughly Addicted"! I have played this through several times now and for all who have commented on the difficulty of particular levels (in timed "Casual" mode), I'm here to say it can be done. If I can do it, anyone can! I like the fact that this is a bit different for a Match 3. Instead of swapping Tokens to make matches, you click on groups of a particular color to eliminate them. There are 7 Chapters containing a total of 50 Levels. The beginning Levels are easy, the higher Levels get more challenging and sometimes seemingly impossible. Each time you complete a Level, you are awarded up to 3 Gold Stars, depending on your performance. I really like the fact that you can go back to improve your time for a particular Level and it's all measured by the number of Stars. This is different (and IMHO a great improvement) from the original version of this game. You can play "Casual" (timed) or "Relaxed" (un-timed). I do not like Relaxed mode. Racing against that Timer makes it exciting and for me, and it's the point of the challenge. 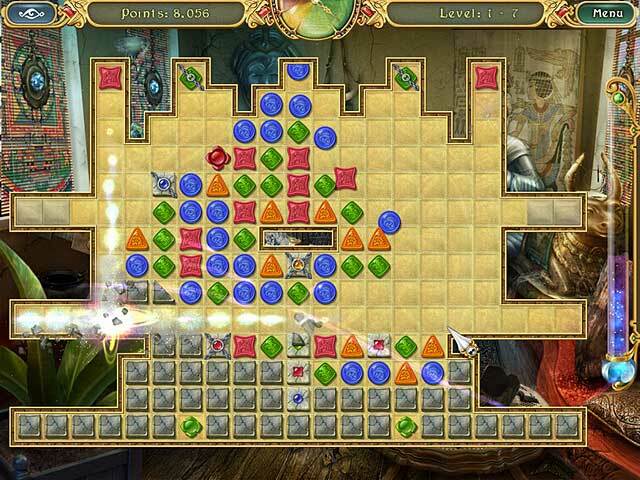 The object of the game is the usual: clear all Tiles, collect all Highlighted Tokens and move all Special Objects off the board by destroying Tokens. And of course, there are the usual deterrents: Stone Tiles (sometimes chained), locked Tokens, Fog, Frozen Tiles (the worst because they freeze everything around them! ), segmented Game-boards and a stingy Timer. 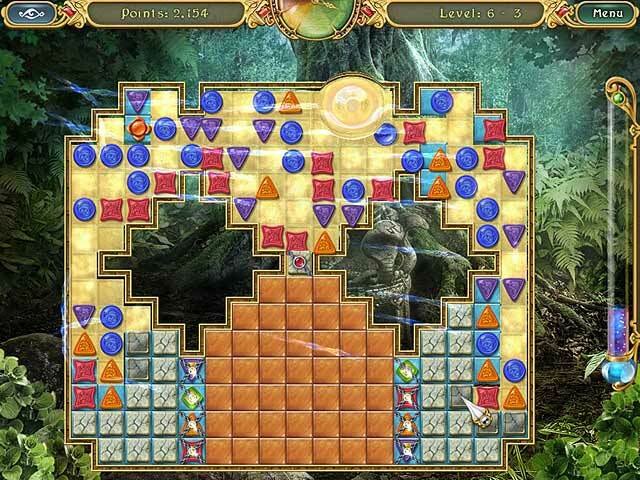 Adventure mode must be completed before you can access the Puzzles and Endless mode. I am only halfway through the Puzzles and when I got stuck on one, I went to see if there was any help on YouTube. There wasn't. Endless mode isn't really "Endless"… it is timed. In Endless mode, each game board that you complete in under a certain amount of time adds 30 seconds to the next Board but the Boards get increasingly more difficult and very soon, at least for me… time runs out. But here's the weird thing: whether I complete 1 or 4 Boards, the message at the end is always the same: "Congratulations! You've completed every Endless mode level!" I doubt that highly. Each time you start a Level, the Tokens are all in EXACTLY the same position on the Board each and every time. BUT, from there they behave differently from game to game. You can restart a Level at any time and your clicking strategy will yield different results. In other words, you can start a particular Level and utilize the exact same initial 6 moves and the result is a different Board to work with than the last time you played that Level with those exact same 6 moves. Example: in Level 7-1, the first thing I do is eliminate the big gap in the middle of the Board by clicking the Silver-metallic Tokens down to merge. It doesn't always work the same way because within the game, Token behavior seems to be independently dynamic. So I know if I cannot merge that gap in a timely fashion, I've lost before I've started and I need to restart. There are no Tools or Power-ups in this game. You are randomly presented with Bonus Tokens like the Whirlwind Bonus which when clicked on in a lilke-colored Group will destroy all Tokens of the same color on the entire Board. Or the Lightening Bonus, which destroys all Tokens in its row and column. I found that using those strategically was the only away to get through the higher Levels. But I wish there was at least a "Shuffle" option. And a "Swap" tool to get out of a jam. Really, we are at the mercy of chance once those Tokens start doing their independent-dynamic thing. Factor into that the occasional mistake or missed move and it compounds to a point where there is sometimes [often] nowhere to go. I am hoping for some Tools in the next version. Overall, I love this game. LOVE! Yes, I really, really enjoy it and have found it entertaining for hours. Rated 5 out of 5 by sherry47t from Loads of fun Just challenging enough to enjoy and relax while you play. BEAUTIFUL graphics, awesome!! I couldn't wait to see what the next round would bring. Highly recommend. Rated 5 out of 5 by LBF242 from A GREAT GAME YOU CAN CONTROL I enjoyed this game as you can control each and every level whether you wanted to play timed or untimed. So when I got tired of trying to beat the clock I just switched the level to relaxed and could finish and go on to the next level change it back to beat the time and play till I got stuck again. Then once I was done I could go back and redo the levels I did not do so good at. Great game did not get so boring replaying each level till you got it so you could go on. Not in this game thanks what a great game. Rated 5 out of 5 by sadie2c from sadie2c fast paced and busy game . I loved it!! Rated 5 out of 5 by Jaz3 from Great Match 3 Game This is the greatest match 3 I have ever played, everyone should get this game and also the 1st Enchanted Cavern. The pictures are beautiful in both games and I can't wait until Enchanted Cavern 3 is made. Rated 5 out of 5 by Oedesh from Enchanting!!! Very fun to play!!!! I LOVED it!!! Just as i loved 7 wonders magical mystery tour!!!! 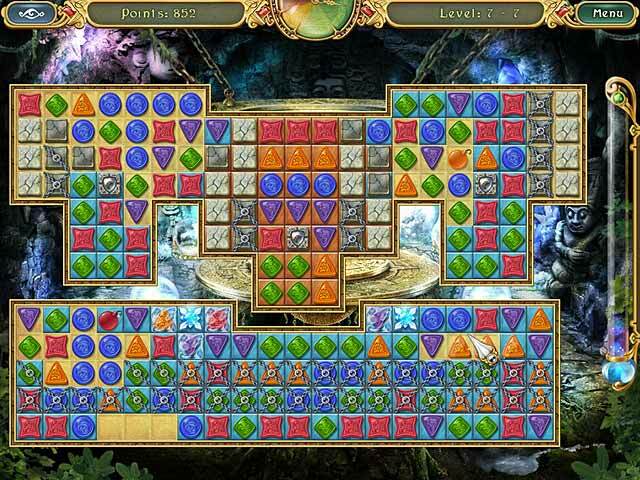 Return to the Enchanted Cavern in this fantastic Match 3 game! Clear the colored jewels as quickly as you can!